The PRGS Classroom Gets "Smart"
I'll open up our latest issue of Findings by following up on the announcement you received that Michael Rich has succeeded Jim Thomson as RAND's fifth President. As you might guess, PRGS is delighted at Michael's selection and his acceptance of this new role with RAND. Certainly we could not imagine anyone better to assume the responsibilities of leadership from Jim, taking particular note of Michael's long-time support for, and belief in, the Pardee RAND Graduate School. In his first days as President of RAND, Michael has been clear he views PRGS as a unique and essential element of RAND, providing talent and capabilities unavailable to traditional think tanks and consulting firms, even as we offer an exceptional educational and professional experience to our students. As you congratulate Michael Rich, please also welcome the 2011 cohort to the Pardee School. Our newest cohort joined us in September and, as you'll see below, we think they are remarkable for the diversity of their experience, backgrounds, and perspective. Recruiting for the 2012 cohort is well underway, with our application deadline on January 5. Please consider joining us as an "alumni ambassador" helping to interview prospective students prior to the admission committee meeting. There is, of course, far more we'd like to share with you. As you read this issue, you'll see that our Director of Admissions, Stefanie Stern, has done a remarkable job bringing us to the modern age in our recruiting; you will hear from one of our students about her research with U.S. Special Operations Forces in the Philippines; and, you'll be one of the first to learn about the new Pardee RAND Graduate School Alumni Leadership Award. We'll be recognizing the awardee at Commencement Weekend, next June — we look forward to having you with us! This year's entering cohort of 21 students is a diverse and talented class. They are varied in their backgrounds, knowledgeable about a broad range of areas, and passionate about policy. Arriving on the doorstep of PRGS with eager minds and bright intentions, they hail from all across the United States and internationally from Burma, China, Ecuador, Israel, Mexico, Nepal, and South Korea. Beyond high GRE average scores (770 quantitative and 640 verbal), 79% of new students already hold an advanced degree, with a combined total of 19 postgraduate degrees. We are proud to welcome them to the PRGS community! Kun Gu Ujwal Kharel Tyler Lippert Zhimin Mao McKay R.
"I was very privileged this year to have been invited to embed with the Joint Special Operations Task Force-Philippines (JSOTF-P) to study the beliefs of the task force members, Philippine security forces, and local Muslim populace. At the request of the Philippine Government, JSOTF-P works together with the Armed Forces of the Philippines to fight terrorism and deliver humanitarian assistance to the people of Mindanao. U.S. forces are temporarily deployed to the Philippines in a strictly non-combat role to advise and assist, share information, and to conduct joint civil military operations. I joined JSOTF-P as they performed security assistance activities and internal defense to help the Philippine government defeat extremist organizations. I was provided with total access to the members and the decision-making activities of the task force and with the necessary armed escorts to safely travel and interview Muslim and Christian Filipinos from Mindanao and the Sulu Archipelago. I also had very open access to leaders and members of the Armed Forces of the Philippines and the Philippine National Police. I returned from this trip with extraordinary data for the dissertation, and an incredible opportunity to benefit high-level military leadership because I will be able to measure whether our military, the Philippine security forces, and the populace share consensus on beliefs about Muslims and Islam in the operating area." Our efforts to provide policy analysis short courses around the world are taking off! In October, Assistant Dean Jeffrey Wasserman and faculty member Gery Ryan collaborated with faculty from the National University of Singapore to teach policy analysis and leadership techniques to Southeast Asian health ministry officials. Additionally, Gery continued his work with the African First Ladies Fellowship program by teaching a second round of classes to this group in September in New York. Closer to home, in August and September, PRGS faculty taught short courses in policy analysis to Congressional staffers and RAND Military Fellows. All of these programs have been very well-received and we look forward to providing more such courses in the year ahead. It is a great way to expand PRGS' reach and influence, and spread the policy analysis gospel! As you may have read recently in a message from Dean Marquis, we are pleased to announce that the Pardee RAND Graduate School has been reaccredited for 10 years by the Senior Commission of the Western Association of Schools and Colleges (WASC). Ten years is the longest possible term for reaccreditation, with most schools receiving reaccreditation for anywhere from seven to ten years. PRGS will provide an interim report in 2016 and will formally begin the next reaccreditation cycle in 2020. In the coming months and years, we will be working to implement the recommendations provided to us by WASC. We are proud to report new technology upgrades for PRGS that are already paying high dividends in the form of an improved classroom experience. Prior to the beginning of the fall term, we installed a SMARTBoard interactive whiteboard and far-improved video teleconferencing equipment in the main classroom. The SMARTBoard has already been a hit. As faculty member Emmett Keeler put it (in his inimitable way), "I have enjoyed playing with the SMARTBoard while teaching Decision Analysis for the nth time this fall. It is disconcerting when your white board seems to be a step ahead of you most of the time. I missed the orientation sessions, but it works like a giant iPad, so it is not hard to tap your way to a basic level of success." In addition to the enhancements this technology brings to those teaching in Santa Monica, it will also allow us to increasingly leverage RAND researchers in Washington, DC and Pittsburgh, facilitating remote teaching. Congratulations to core faculty member Brien Alkire who has won this year's Edwin E. Huddleson, Jr. Award for Outstanding Teaching. The Huddleson Award recipient is chosen by the student body and is presented each year to a PRGS professor in recognition of his or her excellence in teaching. Brien, who teaches Operations Research I, was selected for his careful preparation for each lesson, challenging and interesting classroom instruction, availability to students, and for engaging, encouraging, and inspiring students to their highest levels of achievement. 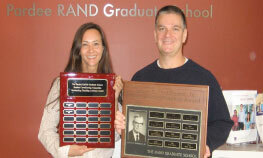 For a list of past recipients, please visit www.prgs.edu/experience/teachingaward.html. This year's Teaching Assistant of the Year award was given to Nicole Schmidt (cohort '09), the TA for Empirical Analysis I. Nicole was selected by her peers for her dedication to "deep knowledge of the subject matter and her high motivation for teaching. For many of us, her teaching was crucial to our success in that class." Fred Iklé, who passed away in November at the age of 87, was a former RAND researcher who not only helped guide United States policy through the tumultuous years of the Cold War, but was also integral to the formation of the Pardee RAND Graduate School. Fred headed the Social Sciences Department and published a number of important reports on U.S. nuclear policy during his tenure at RAND. From 1969 to 1970, he and Charles Wolf, cochaired RAND's Management Committee, the equivalent of today's Operating Group. Fred and Charles were charged by then-President Harry Rowen to decide whether RAND should start its own graduate program in public policy, and if so, how it should be done. After exploring several possibilities, including a partnership with UCLA or Cal Tech, they agreed that if they were going to establish a graduate program in public policy, it needed to be done here at RAND. This recommendation was brought before the Board of Trustees, and it was decided that RAND would establish this experimental graduate program for an initial time frame of three to four years. The plan was originally to appoint Charles Wolf as founding Dean of the school, with Fred assuming leadership after a few years. 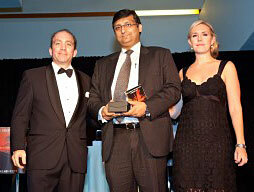 However, at the end of the four years Fred was selected to head the Arms Control Disarmament Agency and left RAND. He continued to enjoy a distinguished career as a foreign policy expert, including seven years as Undersecretary of Defense for Policy for the Reagan Administration (Charles Wolf continued to lead the school for 27 years). Fred leaves as one of his legacies the RAND Graduate Institute—now the Pardee RAND Graduate School—and more than 280 Ph.D. in Policy Analysis graduates in academia, government and private industry continually striving to "Be the Answer". This fall, we have launched PRGS recruitment into the modern technological era! In addition to our traditional recruitment methods and in-person information sessions around the country, we have created more ways to help spread the word about PRGS to prospective students and new methods for them to access information about the program. "Virtual" Information Sessions. For the first time ever, PRGS offered two "webinars" or "virtual" information sessions that could be attended from anywhere around the world by anyone with Internet access. These one-hour sessions were held entirely online so attendees only needed to access a designated website to hear and see webinar slides as PRGS staff (led by our Director of Admissions Stefanie Stern and Assistant Dean Jeffrey Wasserman) and current students (Emmanuel Drabo of the '10 cohort and Ashley Pierson of the '09 cohort) described the program and answered questions. Over 75 attended from around the world. Updated Website. We have a new look! Check out some of the new features at www.prgs.edu. Feature on RAND.org Website. Strengthening our connection with RAND, we have been featured frequently on the RAND external homepage. Alumni and PRGS Supporters Help. Many of our alumni, faculty, and students have helped promote PRGS and the information sessions this fall. We used an "email blast" about these online sessions as a way to spread the word about the event and describe (and, in many cases, introduce) the PRGS Ph.D. program in Policy Analysis. 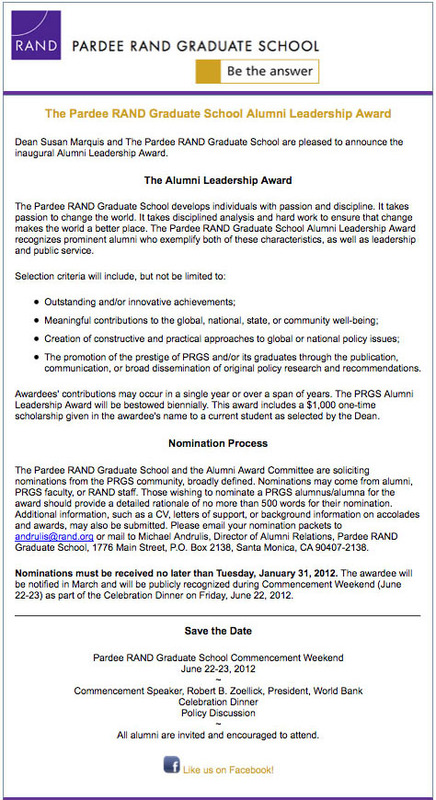 Many thanks to those of you who forwarded this email to colleagues, students and others and spread the word about PRGS. In particular, Diana Epstein (cohort '05) helped to feature PRGS on the AmeriCorps blog and Ben Vollaard (cohort '00) posted a link to PRGS on a website for economists in the Netherlands. Also, many thanks to our alumni who helped at recruitment sessions this fall: Richard Bowman (cohort '06), Meena Fernandes (cohort '05), Jordan Fischbach (cohort '04), and Aaron Martin (cohort '07). **WE NEED YOUR HELP** as alumni liaisons during upcoming interviews with those who have applied to PRGS. Please send an email if you are interested to Stefanie Stern, Director of Admissions at stern@rand.org. PRGS students continue to be extremely marketable as they seek employment upon graduation. The Office of Career Services is very proud of the fact that 100% of our new graduates attain employment in policy-relevant positions within 6 months, even in this very challenging job market. You, as alumni can help us maintain this extraordinary accomplishment. Please stay connected with PRGS and help our alumni career network grow. If you haven't already, consider joining the PRGS group for alumni and current students on LinkedIn. "I'll take RAND for $200, Alex!" For the first time ever, RAND will be a featured category on the long-running TV game show Jeopardy! To test your knowledge of RAND history and research (will they mention PRGS?) mark your calendar or set your TV recording device for Monday, December 12. Check your local television listings for exact times and channel information. After your graduate school experience here…how well do YOU know RAND? Seoul, South Korea, June 3, 2011 — On business travel to South Korea, Jack Riley (cohort '88), vice president of the RAND National Security Research Division and director of the RAND National Defense Research Institute met with Yong-Sup Han (cohort '88), Kyong-Mann Jeon (cohort '80), SungHo Lee (cohort '00), and Ku Shin (cohort '88) for a dinner to connect with other PRGS alumni. Santa Monica, June 14, 2011 — On the third floor terrace of the RAND building, ten alumni, their guests, and many friendly faces of favorite PRGS faculty and staff joined for an anniversary celebration. Alumni who came out on this warm evening were Michael Beltramo (cohort '70), Sam Bozzette (cohort '91), Myles Collins (cohort '05), Ashlesha Datar (cohort '99), Mary Anne Doyle (cohort '87), John Fei (cohort '04), Jordan Fischbach (cohort '04), Jack Riley (cohort '88), and Jeffrey Wasserman (cohort '85). Dean Marquis welcomed the alumni and their guests and special remarks were made by Founding Dean and distinguished researcher, Charles Wolf. Washington, D.C., September 19, 2011 — Dean Marquis formally kicked off the second year of The Washington Experience by inviting all PRGS Alumni and RAND Alumni to the D.C. office for a research poster presentation by students Chaoling Feng (cohort '09), Abigail Haddad (cohort '09), Kay Sullivan (cohort '08) and Elizabeth Wilke (cohort '07). Twenty-two alumni, students and staff attended this memorable late-summer event. PRGS Alumni attending were Richard Bowman (cohort '06), Diana Epstein (cohort '05), John Fei (cohort '04), Mark Gabriele (cohort '93), Samantha Ravich (cohort '92), Alex Rohozynsky (cohort '00), Anna-Marie Vilamovska (cohort '05), and Kathi Webb (cohort '94). RAND Alumni and current staff attending were Steedman Hinckley, Paul Kozemchak, Linda Martin, Hannah Young Moore, Joanne and Don Palmer, Mary Jane Penzo, Terri Tanielian, and Bruce Woodyard. APPAM Reception in Washington, D.C., November 4, 2011 — At the annual conference for the Association for Public Policy Analysis and Management (APPAM) held in Washington, D.C., PRGS held its own reception for alumni, students, and friends of PRGS. Attending alumni included Richard Bowman (cohort '06), Abby Brown (cohort '02), Lindsay Daugherty (cohort '05), Diana Epstein (cohort '05), John Fei (cohort '04), Qian Gu (cohort '04), Larry Picus (cohort '84), Bogdan Savych (cohort '02), Baoping Shang (cohort '00), Mike Shires (cohort '90), Brooke Stearns Lawson (cohort '05), Anna-Marie Vilamovska (cohort '05), and Yuhui Zheng (cohort '03) and current students Liz Brown, (cohort '05) Harry Dogo (cohort '07), Eileen Hlavka (cohort '07), Ethan Scherer (cohort '07), Jessica Yeats (cohort '10) and Chaoling Feng (cohort '09). 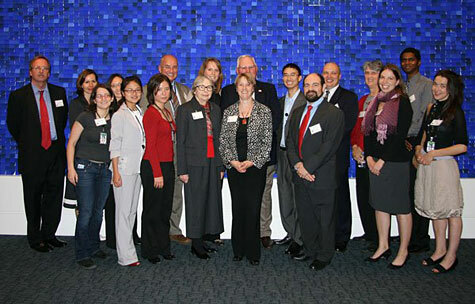 Photos of this event can be found on our Facebook page: www.facebook.com/PardeeRANDGraduateSchool. Boston Alumni Dinner, September 21, 2011 — Dean Marquis hosted three alumni and one current student working in the RAND Boston Office for dinner. Alumni attending were Bogdan Savych (cohort '09), Richard Bowman (cohort '06), and Yuhui Zheng (cohort '03). Current student Ethan Scherer (cohort '07) was on hand to share his experiences conducting research in the areas of K-12 education, behavior and civil laws, regulation and insurance. Albuquerque, New Mexico, October 20, 2011 — Dean Marquis had dinner with recent alumni Richard Bowman (cohort '06), and Meg Blume-Kohout (cohort '04), as well as current student Claudia Diaz (cohort '06), at Church Street Café in Old Town Albuquerque. As Richard and Meg are both recent alumni, the conversation among the four of them focused on their careers and how they each are working to make their impact upon public policy in education. New York Alumni and Board Dinner, November 3, 2011 — Alumni and Board members enjoyed an intimate dinner at Bar Boulud. Alumni attending were Yuhua Bao (cohort '09), Mike Dardia (cohort '09), Chris Ordowich (cohort '09), Jeff Peterson (cohort '09), and Nishal (Nick) Ramphal (cohort '09), as well as Board of Governors members Jane Cavalier and Faye Wattleton. To help the alumni get to know each other and the board members better, each shared their connection to PRGS, and where they are working now, as well as their career path. Board members Jane Cavalier and Faye Wattleton shared their reasons for such interest in the School and why they value their service through the Board. The alumni shared their experiences while at PRGS and how their educational experience was life-changing and uniquely prepared them for the positions they have now. Stay tuned for news on upcoming events! Please keep your email address and mailing address current with PRGS by dropping us a line at prgs@prgs.edu to ensure you're invited to future events in Santa Monica, Washington, D.C. and around the world! Ricardo Basurto (cohort '03) has moved back to Los Angeles to take on a new opportunity as Health Economist at the L.A. County Department of Public Health. Peter DeLeon (cohort '71), of the University of Colorado at Denver, was designated by the Regents of the University of Colorado System as a University of Colorado Distinguished Professor. The Economist has favorably reviewed Drugs and Drug Policy: What Everyone Needs to Know, saying it successfully sorts drug use and treatment myths from facts to the benefit of substance abusers, their loved ones, and professional stakeholders. Mark Kleiman of UCLA coauthored the book along with Jonathan Caulkins of RAND and Carnegie Mellon University, and PRGS alumnus Angela Hawken ('98 cohort), now an associate professor at Pepperdine University. Read More at economist.com. Phillip Romero ('83 cohort) published a new book entitled Your Macroeconomic Edge: Investing Strategies for the Post-Recession World. The book is available through Business Experts Press. PRGS alumnus Connor Spreng (cohort '01) led a World Bank/International Finance Corporation project assessing how governments and the private health sector are working together in forty-five African countries. He was also the lead author of the resulting publication, Healthy Partnerships: How Governments Can Engage the Private Sector to Improve Health in Africa. PRGS alumnus Neeraj Sood (cohort '99), now on faculty at PRGS as well as at the University of Southern California, served as the PI for the RAND component of this study. Read the report at wbginvestmentclimate.org. A new collection of essays by experts from the RAND Corporation examines America in the decade since the 9/11 terrorist attacks, focusing a critical eye on the nation's subsequent actions and outlining changes in strategy needed to improve efforts against jihadist groups. Three PRGS alumni and current RAND staff—vice president K. Jack Riley (cohort '88), senior policy researcher Eric V. Larson (cohort '89), and PRGS assistant dean Jeffrey Wasserman (cohort '85)—each authored chapters in the book, as did several PRGS faculty members. Charles Bennett (cohort '87) and Ying Liu (cohort '04) contributed their expertise to a research letter entitled "Pharmaceutical Fraud and Abuse in the United States, 1996-2010" in the September, 2011 issue of Archives of Internal Medicine. Where In Social and Sexual Networks Should HIV Interventions Target?